(Natural News) Many people who are trying to lose weight discover that sweets are their weakness, so they turn to artificial sweeteners in hopes of continuing to enjoy their favorite treats without all the calories and weight gain associated with sugar. After all, it’s sugar that causes type 2 diabetes, right? According to a new study that was recently presented at the European Association for the Study of Diabetes in Portugal, it’s not quite that straightforward. In fact, if avoiding diabetes is high on your priority list – as it should be – artificial sweeteners provide a false sense of safety. University of Adelaide researchers set out to determine whether large quantities of calorie-free artificial sweeteners could affect the way the body controls blood glucose levels. They recruited 27 healthy volunteers for their study and divided them into groups, one of which consumed capsules containing the sweeteners acesulfame K and sucralose in amounts equal to those found in 1.5 liters of a diet drink each day. At the end of the study, tests showed that those who consumed the sweeteners had an impaired response to glucose, supporting the notion that these sweeteners can predispose people to developing type 2 diabetes. Making matters worse is the fact that only two weeks of consuming sweeteners was enough to cause the effects. 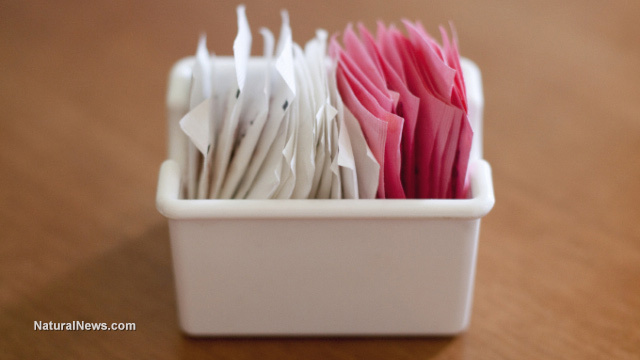 Past studies have shown that the artificial sweetener saccharin can modify gut bacteria and harm the body’s ability to digest nutrients, thereby creating glucose intolerance that can lead to type 2 diabetes. A study from Israel’s Weizmann Institute of Science found that artificial sweeteners promote diabetes and obesity after studying mice who drank water containing aspartame, sucralose, or saccharin. After just five weeks, their glucose metabolism spiked, with saccharin being the biggest offender. Those who drank glucose water had normal metabolisms. Our nation’s sugar habit – Americans typically eat 30 to 40 teaspoons of it a day – is a sure path to obesity and diabetes, not to mention cancer, but turning to the artificial varieties is hardly preferable. More than 40 percent of American adults reportedly consume no-calorie sweeteners each day and many more eat them without realizing it because they are so prevalent in the food products sold in our stores. The FDA says they are safe in moderation, but plenty of studies have cast doubts on that assertion. A 2005 study, for example, found that diet soda caused weight gain in proportion to the amount consumed, and a review this year of a big sample of observational studies discovered those who used artificial sweeteners not only gained significant weight and had a bigger waist circumference; they also had a higher incidence of cardiovascular events, metabolic syndrome, hypertension, and type 2 diabetes. A study from 2008 revealed that drinking more than two diet sodas a day doubled a woman’s risk of kidney decline, while a 2012 study found a link between diet drinks and a higher risk of vascular events. It has also been linked to bladder cancer. It’s clear that if you don’t want to be one of the 30.3 million Americans who has diabetes, you’re going to have to give up sugar as well as sugar substitutes. It’s a small price to pay to avoid a disease that can seriously impact your quality of life and then kill you. The good news if your sugar or sweetener habit has already led to type 2 diabetes is that a new report published in the British Medical Journal said that the disease can go into remission if sufferers manage to lose 15 kilograms, which is roughly 33 pounds. Nevertheless, the best course of action when it comes to diabetes is preventing it in the first place – and that means avoiding sweets of all types.